RBC has an outpeform rating and a price target of $40 a share on the company's stock. 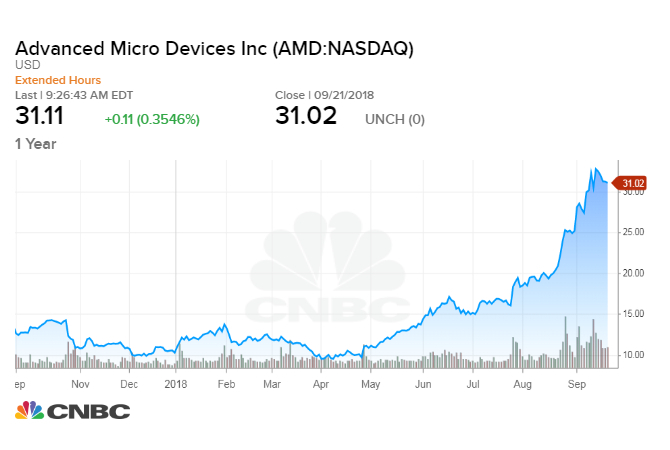 "This gives us belief in the AMD product cycle and potential to gain market share," RBC analyst Mitch Steves says. RBC Capital Markets began coverage of AMD on Monday, saying the steady demand for gaming chips and the company's solid gains in the server market make the stock underrated. "While we think the stock will remain volatile, we note that AMD trades at a notable discount on a sales basis relative to peer Nvidia," RBC analyst Mitch Steves said in a note. Shares of AMD ended the day 5.2 percent higher in trading at $32.62 a share. RBC has an outperform rating and a price target of $40 a share on the company's stock, which is about 29 percent above AMD's closing price Friday of $31.02 a share. AMD's latest graphics processor "is competitive," Steves said, and he expects "the second generation should surpass Intel from a performance vs. cost basis." RBC said the potential for AMD to continue to gain in the server market may steadily add "high margin revenue." "This gives us belief in the AMD product cycle and potential to gain market share," Steves added. RBC joins several analysts on Wall Street becoming more optimistic about future market share gains for AMD. The chipmaker's stock is significantly outperforming the market this year. Its shares are up 202 percent year to date through Friday.